Celbar environmentally friendly insulation is a blend of recycled specially prepared cellulose fibres, organic in nature and treated to make it fire retardant to Class 0 (top classification). Tests have shown that when packed together, this natural cellulose environmentally friendly insulation material is acoustically and thermally more effective than man-made mineral wool. Celbar is typically used as a acoustic and thermal cavity filler between floors and walls, in conventional rigid construction or in isolated floating ceiling systems. e.g. our Oscar Iso Mount acoustic ceiling system. 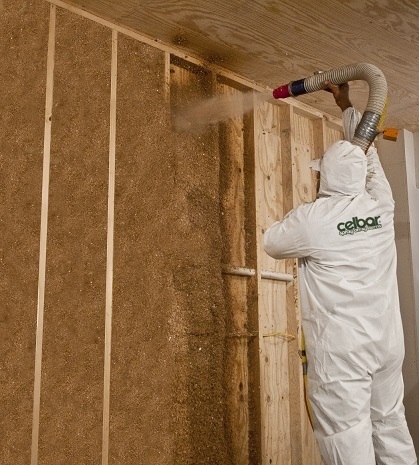 Celbar environmentally friendly insulation can either be sprayed into the cavity before the void is closed OR where a void is already closed it is blown by hose through holes to improve the acoustic insulation of ceilings and walls. When two layers of plasterboard are used, the Celbar environmentally friendly insulation is blown in and holes filled before the second layer is fitted. Celbar environmentally friendly insulation provides the excellent acoustic and thermal insulation performance demanded by designers, owners & occupants. Click here to see main Celbar product page. Older properties with ornate ceilings benefit with Celbar blown into the ceiling void reducing noise from rooms above [with thermal insulation benefits]. It is blown into the void through small holes cut into flat areas of the ceiling and repaired afterwards or if major refurbishment is taking place it is filled from above by lifting floorboards. Consider a wooden rod versus a glass rod over a heat source. The glass rod conducts heat readily, the wooden rod doesn’t. Traditional mineral wool insulation is a mass of small glass rods, additional insulating power is lost when it is compressed and it is uncomfortable to work with. The fibre is organic cellulose derived entirely from recycled macerated paper and treated with a borax compound to protect against fungus, insects and rodents. It also has fire protection built in. 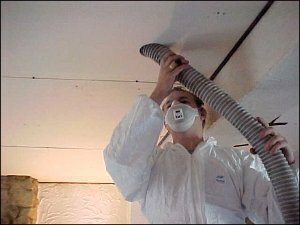 Celbar cellulose insulation has excellent thermal resistance and provides a high degree of thermal insulation. Recycled material and a low manufacturing energy requirement combine to produce possibly the most environmentally friendly insulation material used in building construction, low CO2. Celbar achieves M1 certification for Builing Material Emissions; the best possible classification. See Celbar Main Product Page for more details on its eco friendly building acoustics properties. For more information regarding our environmentally friendly insulation materials or if you have any questions regarding building acoustics you can call us direct on 01474 854902. Alternatively, please fill in our enquiry form via our contact us page and we'll get back to you as soon as possible. Environmentally Friendly Insulation article by D.Mack of Oscar Acoustics.